Pavarana marks the end of the three-month Vassavasa, the rainy season retreat observed by Theravada monastic communities. Commonly falling on the full moon of the 11th month of the lunar calendar, usually in October, this year the occasion was celebrated on 27 October. Pavarana means “inviting admonition”—an invitation to one’s monastic colleagues to give admonishments for any offences committed during the three-month retreat when monastic members lived together communally, thereby helping to ensure observance of the Vinaya, the regulatory framework of the monastic sangha. Pavarana is a ritual pursuit, and the Patimokkha—the disciplinary precepts of the monastic order at the heart of the Vinaya—is also recited on this day. Each monastic is invited to prostrate before their fellow bhikkhu (monks) or bhikkhuni (nuns) while the Patimokkha is recited. While Pavarana encourages monastics to evaluate one another’s conduct, the Patimokkha encourages each sangha member to examine their own behavior. From the Pavarana we can understand the ceremony as an expression of the sangha’s collective adherence to discipline, and by observing Pavarana, sangha members can gain insight into the nature of disciplined action. Pavarana is also a welcoming ceremony commemorating the Buddha’s return from Tavatimsa (the Heaven of the Thirty-Three), the second of the six heavens in the Desire Realm. 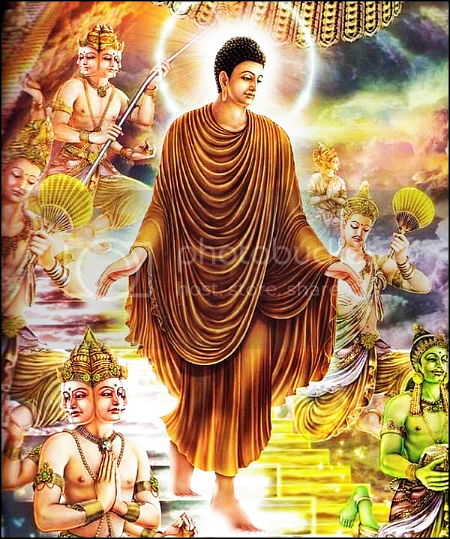 According to legend, seven years after he became enlightened, the Buddha went to the Heaven of the Thirty-three during Vassavasa to expound his teachings to the assembled gods, including his mother Mahamaya, who had passed away just seven days after his birth. The Buddha taught them the Abhidhamma Pitaka, the last of the “three baskets” that constitute the Tipitaka of the Pali Canon. After three months, the Buddha came down to the city of Sankassa, in the modern-day district of Farrukhabad in the Indian state of Uttar Pradesh. Today, Sankassa is a Buddhist pilgrimage destination, and several schools of Buddhism have established monasteries there. Pavarana is observed by Theravada Buddhists throughout the world by performing various meritorious acts. In the morning, lay people gather in the temple to undertake the Five or Eight Precepts for the day. There is a long period of chanting, paying homage to the Buddha, the Dhamma, and the sangha, accompanied by offerings of food, flowers, incense, lamps, and other items, which concludes before noon. The devotees then serve a meal to the monastics before enjoying whatever is left over. The afternoon session begins with Dhamma talks by the monks and a talk on the significance of Pavarana. The ceremony is then concluded by sharing the accumulated merit with relatives and all sentient beings. In a number of Theravada Buddhist societies, including Bangladesh and parts of Thailand, the evening following the ceremony is marked by festivities. Devotees launch “sky lanterns”—hot-air balloons made of paper with a small flame suspended in the middle—known as fanush in Bangladesh and khom loi in Thailand. In Bangladesh, the evening festivities often draw hundreds of people, including those of other faiths, in a gesture of religious harmony. In Thailand, Pavarana is known as “Wan Awk Phansa,” or “the day of leaving the rains retreat,” and the evening is marked by processions of illuminated boats, notably on the Mekong River in the province of Nakhon Phanom and the Muni River in Ubon Ratchathani. The boats, which can be up to 32 feet long, are filled with offerings such as sticky rice sweets wrapped in banana leaves and decorated with flowers, candles, and lamps. Some celebrants launch their own, smaller vessels and race each other along the river. Pavarana is followed by the Kathina robe-offering ceremony for those monks or nuns who have observed Vassavasa. Up until the full moon of the 12th lunar month, lay Buddhists offer donations to the temples, and in particular new monastic robes, one of the four requisites of monastic life (food, clothing, shelter, and medical care). The historical background for this is mentioned in the Vinaya Pitaka: while the Buddha was dwelling at Jetavana Vihar in Shravasti, he was visited by a group of 30 monks after Vassavasa. The Buddha asked them about their retreat and noticed the worn condition of their robes. It is said that monks at that time would make their robes by sewing together discarded rags and pieces of cloth collected from cemeteries, garbage dumps, and the like. To rectify this, the Buddha granted permission for the Kathina ceremony to be held after Vassavasa. Pavarana is therefore a day of both historic significance and an opportunity to make merit, benefiting not only the members of the monastic sangha but also lay Buddhists, who are afforded the opportunity to welcome one another with metta—loving-kindness and compassion—thereby enhancing harmony within the community. Rhys Davids, T. W., and Hermann Oldenberg, trans. 1881. Vinaya Texts – Vol. 1. Oxford: Clarendon Press.